Super Mario Odyssey was the first game in the Mario Bros. franchise to be released for the Nintendo Switch. Once again, Mario was tasked with rescuing Princess Peach from the clutches of Bowser. The game, released on October 27, 2017, saw a return to the 3D open worlds from Super Mario 64 and Super Mario Sunshine and a life meter last seen in Super Mario Galaxy. However, the traditional power-up system was replaced by a new ability/sidekick: Cappy. Cappy was a spirit that resembled Mario’s cap and allowed him to possess various beings in the world in order to use their unique abilities to complete objectives and pass obstacles. All the while, Mario had to collect Regional Coins and Power Moons in each level to progress and purchase new hats and costumes needed for certain tasks. The game was a hit with fans and critics, being called one of the best in the series and taking home numerous awards. By the end of the year, it had sold over nine million copies. To help promote the game, Nintendo partnered with Kellogg’s to release a limited-edition cereal: Super Mario Cereal. 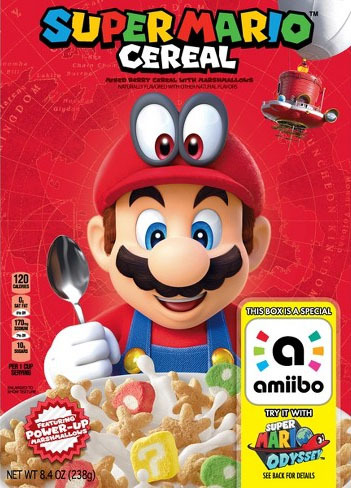 This marked the first time Mario had headlined a cereal since Ralston’s Nintendo Cereal System at the end of the 1980s. The cereal was officially released in December of 2017 but didn’t hit store shelves until early 2018. Ironically, even though Odyssey doesn’t feature any of the usual power-ups from the franchise, the cereal based on it is full of them. The cereal pieces were shaped like Starmen with a hint of berry flavoring. The cereal also had marshmallows shaped like Question Mark Blocks, 1-Up Mushrooms, and Mario’s hat. 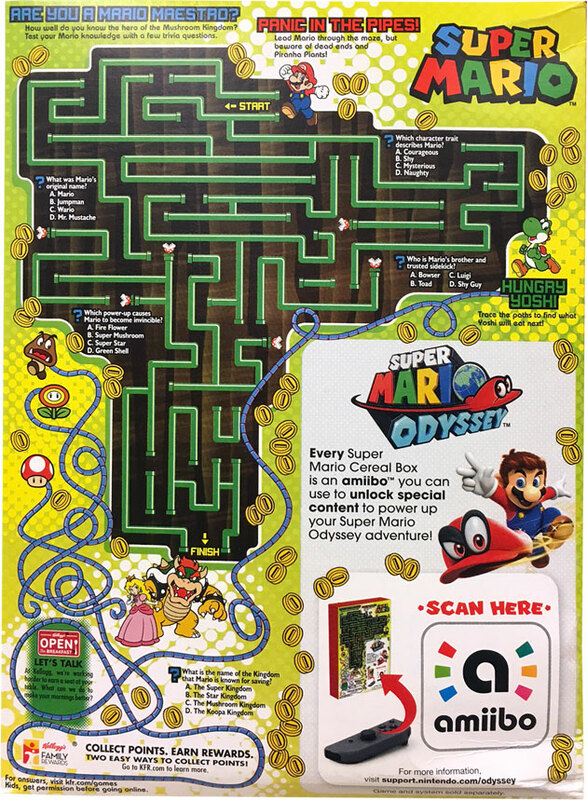 On the back of the box, there was a maze game and Mario trivia amongst images of Mario, Bowser, Peach, Yoshi, coins, a goomba, piranha plants, Super Mushrooms and Fire Flowers (the latter two not even featured in the game). A special feature of the box was that it’s also an amiibo that worked with the game. Amiibo are figurines that could be purchased to add content to various 3DS, Wii U and now Switch games by placing their base on a sensor. Similarly, the box has a chip located in a marked corner of the back of the box that can be held to the Switch’s scanner on the controller. Known as the “delicious amiibo”, it gave the players a number of coins and a heart, and could be used multiple times, and could be used with the in-game character Uncle amiibo for an extra Power Moon finder. Comparison of the prototype box art and the newly released box. 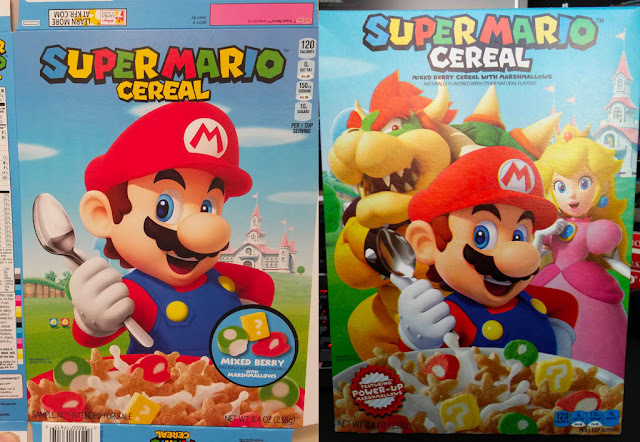 In March of 2018, it was revealed that new boxes of Super Mario Cereal had begun hitting store shelves. These boxes closely resemble an early prototype, which featured Mario holding a spoon behind the cereal with the Mushroom Kingdom in the background. The official box included Bowser and Peach between Mario and the background. But, the biggest change seems to have been the removal of the amiibo functionality.